In recognition of his solo flight across the Atlantic, Charles Lindbergh received the Medal of Honor from President Coolidge. Lindbergh, in the 'Spirit of St. Louis', departed on his record-setting flight from Roosevelt Field airport near Mineola, Long Island on May 20, 1927 and landed 33.5 hours and 3,600 miles later at Le Bourget Airport in Paris. This cross-Atlantic flight set Lindbergh's name forever in history and earned him the $25,000 Orteig Prize from Raymond Orteig, owner of the Lafayette Hotel and Breevort Hotel in Manhattan. When Lindbergh returned to New York on June 13, 1927, he was celebrated in a ticker-tape parade from Lower Manhattan through Central Park, and by March 21, 1928, Congress and President Coolidge presented the pilot with the Medal of Honor. As reward for the successful flight, Lindbergh received the Orteig Prize at the Breevort Hotel on June 17, 1927. As an honorary prize, he received the first Masters of Aeronautics degree from NYU. The Roosevelt Field airport on Long Island closed in 1951 and is now the site is used as retail shopping, but the nearby Cradle of Aviation Museum preserves the history of the site, including Charles Lindbergh's first plane and flight gear. Orteig's Lafayette Hotel is no more, and the site at University Place and East 9th is now The Lafayette, a residential building. The Breevort Hotel, where Lindbergh was presented the Orteig Prize, survived 100 years up to 1954, but is now the site of a large residential building. 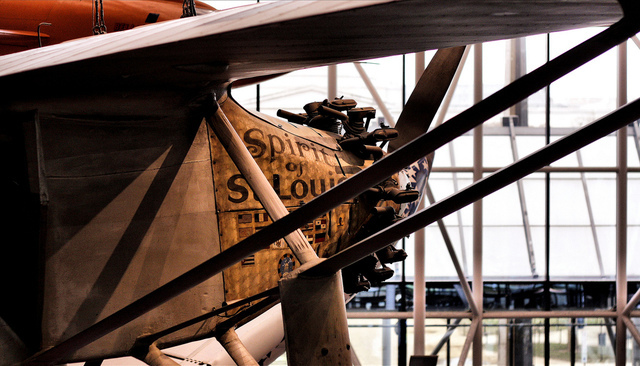 The 'Spirit of St. Louis' is on permanent display at the Smithsonian's National Air and Space Museum in Washington D.C. The Lindbergh Meat Market in Bay Ridge claims to have opened the same day in 1927 when Charles Lindbergh paraded down Fort Hamilton Parkway.